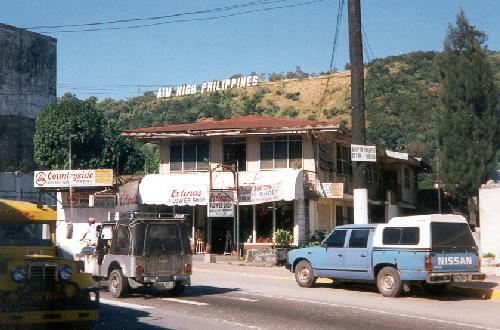 - "Aim High Philippines" - So says the sign on the hill above Olongapo. Posing are a couple cousins, Gilbert and David. 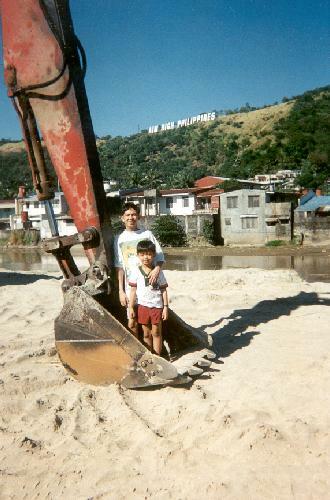 The sand is actually ash from the Pinatubo Volcano that gets washed down by the river whenever it rains. - Family Home - The same sign as above and that's my late grandmother's home in the center where some aunts and uncles still live. 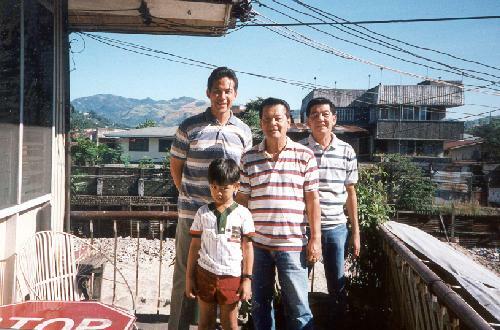 - On the Balcony - ... of the house above with Uncles Jun and Gil, and cousin David. This balcony gets crowded and noisy whenever there's a holiday and the parades pass by on the street below. Popular holidays are Rizal Day and New Year's. 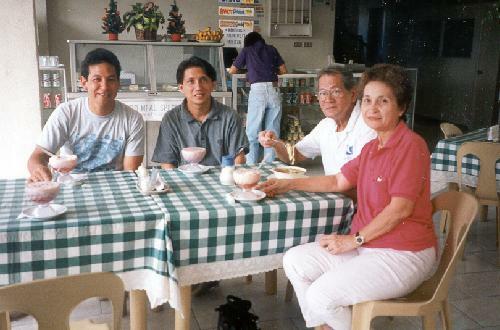 - Another Family Snapshot - Stopping for a snack at a small restaurant in the town of Subic. Looks like the desert "halo-halo", a "mix" of ice cream crushed iced, fruit, candies, and more. With me is a cousin Jonathon, an architect, and Uncle Dael and Aunt Ulrika. We were taking a drive to look at a new development of beach front homes.